Aviva is best known for her iconic Signature Velvet Collection which she developed and launched in her inaugural year. Real objects are pressed into fabric by hand, one at a time in our design studio. Dyes are mixed by hand in small batches, and we choose every blossom, coral and feather each time we print. No two are alike. Touch them and you will feel how each object is engraved with exquisite details, exactly as it is in nature. The award-winning Signature Collection is collected by the Brooklyn Museum and retailers globally. Made with Love in our design studio in California. 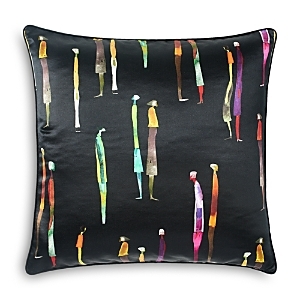 Aviva Stanoff is known for her award winning artistry in textile design. Each pillow is treated like a canvas—her hand painted designs are printed one at a time to order. Each is a celebration of the beauty of imperfection—the beauty that only occurs when color, artist, and canvas are in perfect harmony. It's a big heart. You can't really have too many of those around these days. Each one is made by hand, using a Shibori technique. No two are alike. It is a celebration of the beauty of imperfection, good vibes, and showcasing an artist at play. Each of these pillows are hand painted. It is a beautiful showcase of how artful the artisans are at Aviva Stanoff Design. Each pillow is treated like a canvas—no two are ever alike, but each celebrates how beautiful it is when colors mingle in that unexpectedly magical way—a collection of beauty of artisan and function. Each item is hand painted and made with love in our design studio in California. Aviva loves finding cozy, functional textiles that not only create a tiny oasis but simultaneously are bold statement pieces. In this collection, you will find several options of cozy luxe in faux fur, each with a beautiful hand, luxuriously plush, and guaranteed good vibes. Gravity Gradient Striped Pillow. These hand-painted silks are a showcase of how artful our dye masters are. Mineral on Midnight Moon Pillow. This pillow is part of our Signature Velvet Collection that celebrates nature, exotic surface design, and Deliberate Luxury. Stardust Pillow. This pillow is part of our Stardust Collection, which celebrates elevation. We want to reach up, dream, and fly. Handcrafted pillows sold individually. Mongolian pillow (shown in front) has twice-dyed Mongolian sheepskin (China) front with polyester reverse. 20" x 12". Imported. Shibui pillow (shown in middle) has hand-painted Belgian linen front with silk dupioni reverse; no two are exactly alike. 20"Sq. Made in the USA. Estate pillow (shown in back) made of polyester. 24"Sq. Made in the USA of imported materials. Hidden zippers. Feather/down inserts. Pillow with star pattern. Each of our Mongolian Sheepskin hides are hand-dyed twice—sometimes three times! These natural furs are extremely luxurious, fluffy, and guaranteed to throw a bit of cozy, plush, drama around in any space. Pillow with alpaca front. Handcrafted pillow. Silk/cotton front; silk dupioni back. Feather/down insert. Silk pillow. Hand loomed and hand painted front. Silk dupioni back. Feather/down insert. You read that right! It's warm, light, hypoallergenic, and magical. It's as if a Unicorn hired Aviva to redo her Boudoir. Perfect, right? 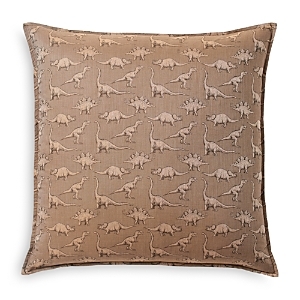 Linen pillow with rhino embroidery embellished with glass beads Linen/rayon pillow. Front is decorated with jute tassels hand wrapped with rayon threads. Linen pillow with botanical glass bead embellished embroidery. Linen pillow hand decorated with cording and tassels. The jute cords are hand wrapped with boldly hued rayon yarn. Handmade tassels are jute with brass detail. Bargello is a traditional needle-craft featuring long floats of wool embroidery to create geometric patterns. Each pillow is hand made and takes roughly 32 hours to make A marriage of traditional and Mod styles, our Needlepoint Personality Pillows show your true colors with a bold bar of color and an announcement of your raison d'être. Each pillow is embroidered by hand and backed in luxe velvet. Forget the fusty needlepoint of yore and embrace our sharp and chic of now. Handcrafted velvet pillow with floral embroidery. Twisted cording finish. Handcrafted pillow with beaded spots. Handcrafted pillow with frog in pond appliqués. 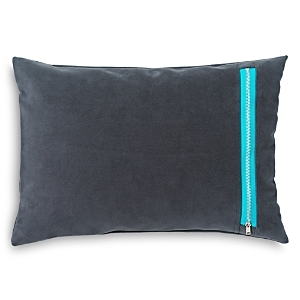 Handcrafted pillow with felt, velvet, and faux leather trim. Handcrafted pillow with geometric embroidery. Mother-of-pearl embellishments. Handcrafted beaded pillow. Handcrafted pillow with tonal, spotted beading throughout. Courtly Check beading around edge. Handcrafted pillow with damask embroidery. Multicolored yarn pompoms at corners. Cotton. Handcrafted velvet striped. Courtly Check piping around edge. Handcrafted woven throw with tassel finish. Handcrafted pillow with multicolored hexagon pattern. Twisted cording finish. Handcrafted pillow with geometric embroidery and appliqués. Multicolored yarn pompoms at corners. Handcrafted striped lumbar pillow. Handcrafted linen pillow with vase embroidery. Handcrafted pillow with beaded spots. 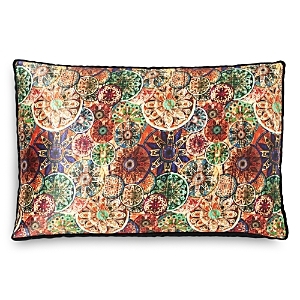 Handcrafted pillow with allover floral beading. Polyester base. 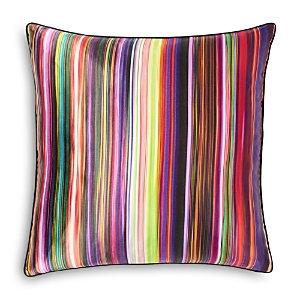 Handcrafted pillow in multicolored, textured stripe pattern. Courtly Check piping around edge. Handcrafted pillow in textured, wave pattern. Courtly Check piping around edge. Linen. Handcrafted pillow with pompom details. Handcrafted striped cotton throw with pompom and tassel finish. Handcrafted pillow in multicolored, textured checkered pattern. Multicolored, tiered tassels at corners. Handcrafted striped pillow with solid reverse. Handcrafted woven throw with tassel finish. Handcrafted pillow with 3D flower details. Handcrafted pillow with glass bead embellishment. Handcrafted MacKenzie-Childs Farm pillow. 24"W x 18"T. Crafted of cotton and linen. Intricate, textured detail. Striped cording trim. Fringed houndstooth throw. Made of acrylic. Pillow with chicken embroidery. Striped border with pompom tassels around edge. Handcrafted pillow. Cotton. Handcrafted outdoor accent pillow. Polyethylene terephthalate (PET) yarn. Pillow reverses from Courtly Check® to Courtly Stripe design. Black ruff trim. Cotton/linen blend fabric. Feather/down insert. Handcrafted pillow with 3D and embroidered floral embellishments. Handcrafted lumbar pillow with 3D and embroidered floral embellishments. 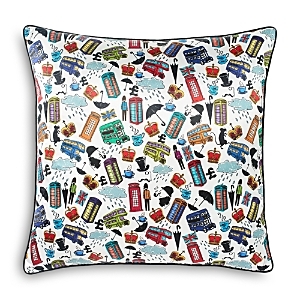 MacKenzie-Childs Chelsea Garden Pillow, 20"Sq. Boheme Butterfly Pillow MacKenzie-Childs Chelsea Garden Pillow, 22" x 16"
Linen pillow with cotton embroidery. Handcrafted pillow with allover beading. Butterfly motif at center. Yarn pompoms detail. Linen pillow with cotton embroidery.